The Gangmasters and Labour Abuse Authority Retailers’ Protocol is set to ensure that issues around agency labour in the UK food supply chain remain firmly in the spotlight. 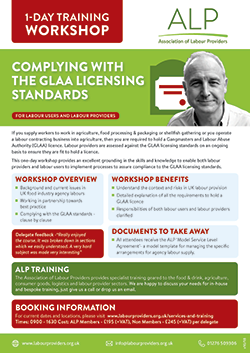 This workshop gives labour providers and labour users the skills and knowledge to implement processes to assure compliance to the GLAA Licensing Standards. Labour providers and end-users are encouraged to attend together, as this workshop emphasis the need to work together to ensure that the Regulations are complied with and are implemented efficiently and effectively. All attendees receive the ALP ‘Model Service Level Agreement’, a model template for managing the specific arrangements for agency labour supply.